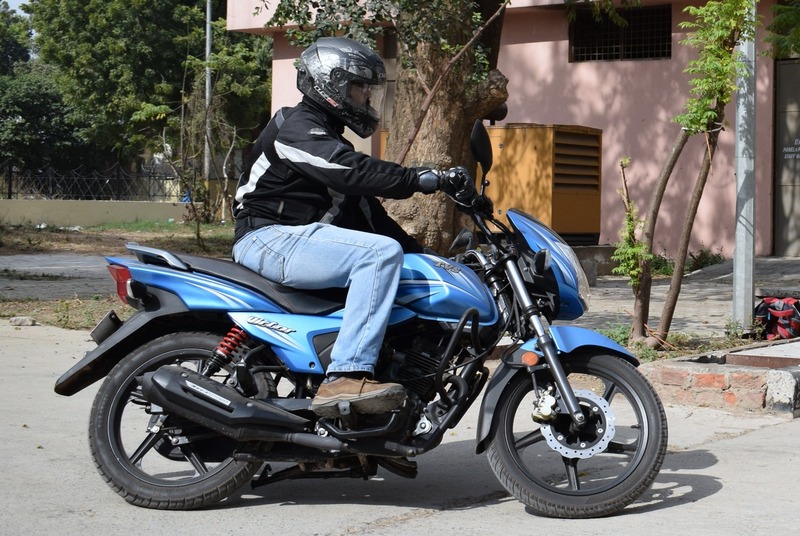 The Indian commuter segment (two-wheelers) is the most challenging section of the market to crack. For years the segment has been synonymous with products first from Hero Honda and now, Hero MotoCorp. There though, have been motorcycles which might not have been able to dent Hero’s volumes, but have left a memory. The TVS Victor is one such brand name. The TVS Victor has a minimum use of decals which makes the bike look understatedly stylish. The 3D badging also helps. While it may still be some distance away from its true glory (volume wise), the numbers are slowly getting there. Reviewing a commuter motorcycle has its perks as well as cons. Going below a certain power output means that you compromise on certain hardware which enthusiasts take for granted. The TVS Victor thankfully does not make you feel alienated. The powerplant is 3-valve, 109.7 cc single-cylinder engine which produces 9.6 PS of power and 9.4 Nm of torque. Both the numbers are more than my segment leader Hero Splendor but does it feel so? Well the TVS Victor did seem to have an edge in terms of top end but the that’s not where 99.9 percent of TVS Victor customers will ride. The TVS Victor is powered by a 109.7 cc 3-valve engine coupled to a 4-speed gearbox. The engine is capable of producing 9.6 PS of power and 9.4 Nm of torque. Riding the TVS Victor in the low and mid-range is a breeze. Pulling off from a standstill at traffic signals will leave most folks behind. 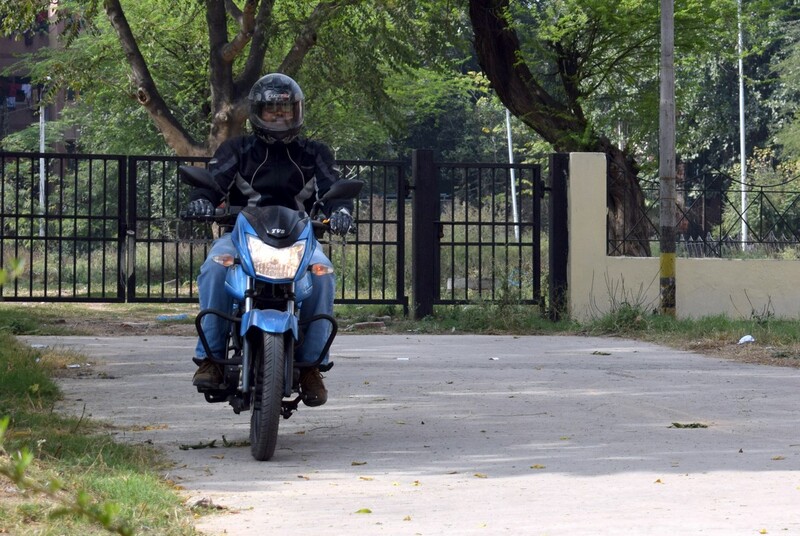 The EcoThrust technology manages to pull the bike’s 113 kg kerb weight and my 80 kg weight effortlessly. The body appears bigger than a run of the mill 100-110 cc motorcycle and the styling has been borrowed from the TVS Star City+. The instrumentation console though has been redesigned. Things remain comfortable till 5,000 rpm, and that is when vibrations start kicking in. The footpegs bear the major brunt while things start going out of hand at 8,000 rpm. Thankfully the power output peaks before that but riding the TVS Victor is fun between 3,000 to around 5,500 rpm. The seat is very comfortable and commuting in peak rush hour traffic will not leave you wriggling to find the right posture. Pillion seat comfort has also been kept in mind, but vibrations are more apparent on the rear footpeg (at high engine speeds). Overall seating comfort is true to TVS’ claim of best in class. 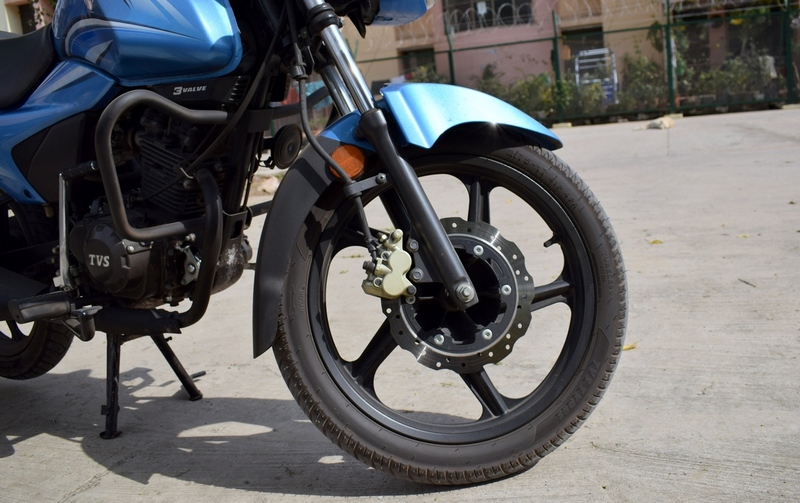 The TVS Victor gets new TVS Remora tyres, which is the best piece of equipment on the bike, and grips better the Ceat Secura branded tyres usually seen in the segment. The gearbox is fun to ride and there are no false neutrals. I would have liked having a 1Down all Up shift pattern but the all Up shift pattern always is synonymous with commuters. The Econometer kicks in around 4,500 to 5,000 rpm, and while I spent most of my time with the TVS Victor in the Red (Power mode), it still managed to return me a real-world efficiency of 50 km/l. Going a bit easy on the throttle will certainly hit the 55+ km/l mark. Flicking the bike around in traffic is easy, and traffic woes will not leave you in sweat. 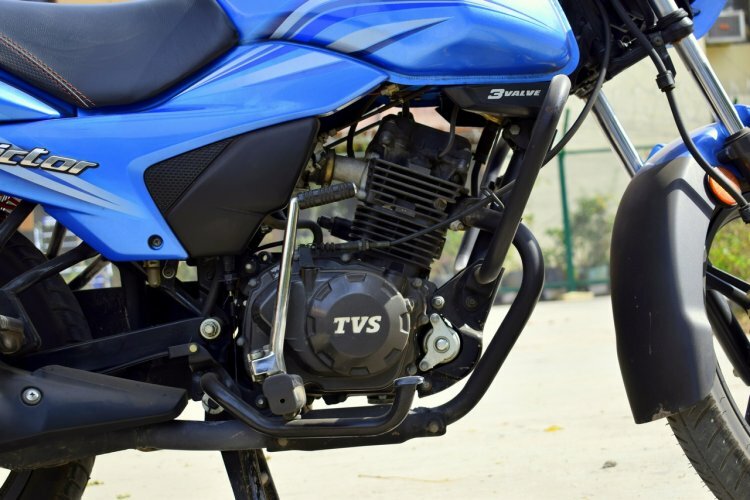 The TVS Victor gets a 5-step adjustable ‘Series Spring’ suspension in the rear which along with the front telescopic setup gobbles up the bumps an average Indian city street has to offer. While Delhi has some of the best roads in the country, I even took the Victor to Old Gurgaon to get a feel of the lunar craters they have. The Victor passed the torture test with flying colours. An hour-long session in Old Delhi traffic too didn’t make me raise any eyebrows. Segment-best tyres also help in keeping confidence levels high. In city commuting, even during peak rush hour traffic, is a breeze on the TVS Victor. The engine does not heat up uncomfortably. The mix of an analogue tachometer and an LCD screen adds to the premium image. The fuel gauge has been integrated into the tacho dial and the LCD screen boasts of a service reminder, a speedometer, an odometer and trip meter. The inclusion of hazard lights is not a regular find in the segment and is a pretty nifty inclusion, but the position of the switch on the right handlebar left me confusing it as an engine kill switch. That is also something which the bike misses out on. Neither does it get an integrated clock in the instrumentation. While that may not be a deal breaker for many but all two-wheelers should have a clock as standard fitment. The optional disc brake in the TVS Victor will save the day, but it is not in the same league of the Nissin caliper in the Honda Livo. The Hero Splendor iSmart 110 though completely misses out on a disc brake. The petal ventilated disc even adds to the looks (now that is something which you do not read every day). The optional front disc brake is a nifty add-on, definitely recommended over the drum brake version. The TVS Victor is available in 6 shades, and the minimum use of decals makes the bike look good. The switchgear quality is premium, and the 60-watt headlamp is a boon for night rides. The new TVS Remora tyres in the Victor are grippy and has certainly left me impressed. However, I could not test the tyres in wet but I expect them to perform significantly better. The 60-watt headlamp can be safely called as best in class, and can give several products in segments above the TVS Victor, a run for its money. Combine this with the well-rounded handling capabilities of the TVS Victor and all my midnight cravings were easily satisfied with a long ride to an all-night fast food joint. At INR 54,015, the TVS Victor is not just priced lower than the segment best product, but is also a worthy challenger and comes close to unseating it. So, good looks, great handling, extremely comfortable seat and best in class tyres. However, should you buy it over the competition? 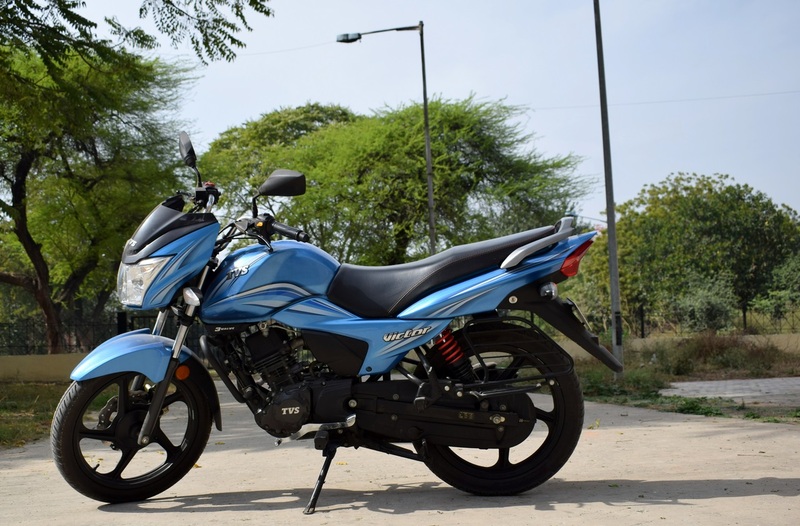 With a price tag of INR 52,015 for the drum brake variant and INR 54,015 for the front disc brake (both prices ex-showroom, Delhi) it is around INR 2,500 to INR 3,000 cheaper than the Honda Livo and INR 3,500 cheaper than the Hero Splendor. 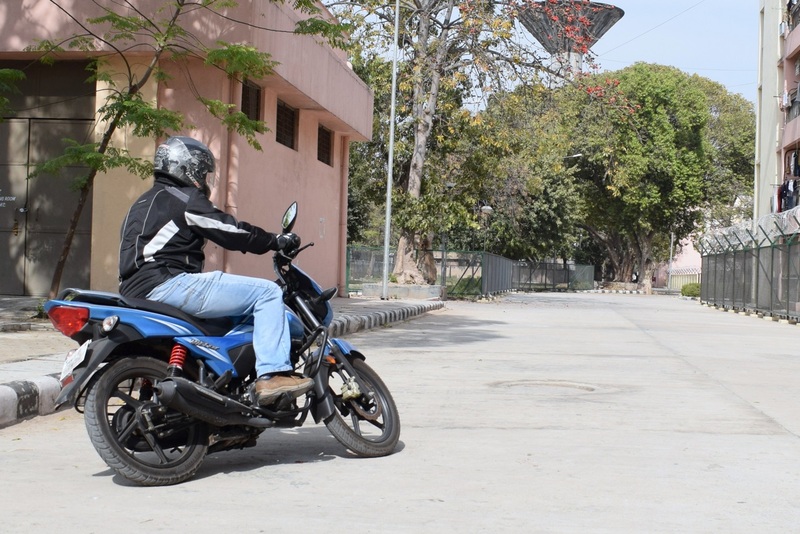 A difference of 3,000 bucks is certainly a number which matters in the commuter segment but if you are after comfort and performance, look no further.